BuyOnTheDip.com ~ Trading Stocks and Options! : BOTD adds SKS on the DIP! 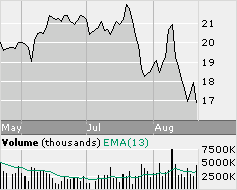 Saks reported today, a bit oversold,....the world loves luxury!!! Total sales jumped 15% to $694.1 million while same-store sales surged 13.2%. its shares fell because it said margins would be flat for the rest of the year. NEW YORK (Dow Jones)--The housing market may be slowing down, but Saks Inc.'s (SKS) top executive said Tuesday that high-end consumers are still spending steady in the luxury retail market. Chief Executive Stephen Sadove told CNBC that the New York-based luxury retailer, which recently opened a new shoe salon in New York City, had strong performance in all categories during the latest quarter. Saks, which early Tuesday said it narrowed its second-quarter loss due to higher profit margins and substantially lower costs, is on the path to "essentially double its operating margin this year," Sadove added. Still, shares of Saks fell 6.2% to $16.83 Tuesday. Sadove said this was due to tough comparisons, citing especially strong selling, general and administration expenses leverage and gross margin growth in the first half of the year. "I think some people were expecting us to keep up the same momentum," Sadove said. That said, the executive is still positive on luxury consumer spending worldwide. A licensed store in Dubai is doing "exceptionally well," according to Sadove, and Saks in New York is getting a boost from European shoppers visiting the U.S. due to the strength of the euro. Shares of Saks recently traded up 1.7% to $17.12 in late trading. While I agree that Saks has had a large fall and the high end customer will still do fine, don't you think there might be better ways to play the high end consumer? COH and JWN both come to mind as companies who have a better track record of solid consistent performance than does SKS. and by the way why do you post so many replies...LOL to attract more people ? we get lazy and want to add stuff without logging in or changing the site. or sometimes we find supporting info, reference old/new price points, analyst comments, etc. ...SKS just feels more global to us. and SKS gets the 'retail mark up' on COH! except that JWN went up 4% and our SKS went down 4% today. to add insult to injury...Cramer said "hold" and "wasn't impressed with the quarter"...and "lower margins =bad"
we are sticking with it for a few more days...but a day when everything was up big and we called this dud, sorry. I still like M and JWN, rather than SKS.